Mitreo di San Clemente – Mithraeum. Our Common Sun. 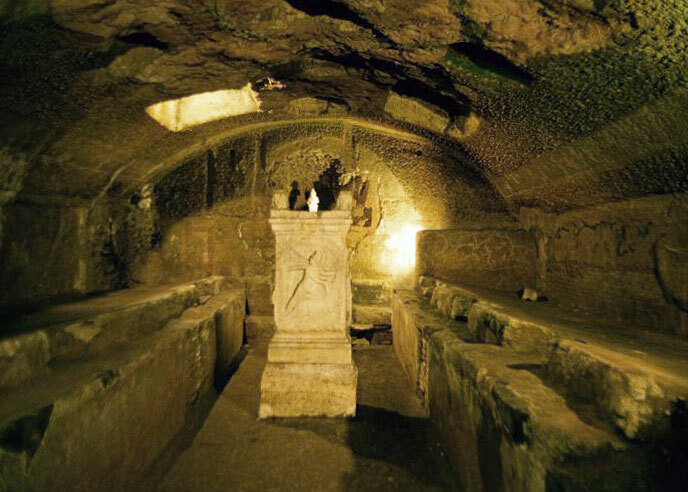 In 1867 a Mithraeum was discovered in a notable Roman house, situated under the Basilica S. Clemente. As a continuous flow of water made further investigations impossible in the beginning, the excavations could only be continued in 1914 after the construction of a water-tunnel. One enters the Mithraeum after descending a number of stairs and passing through a room iin front of it. Then come the actual entry (Br. 1.50), which was constructed in later times when the Mithraeum was built. It shows the usual division into a plastered central aisle (Br. 2.15) and two benches, sloping towards the walls. They can be ascended at the front via two steps. The left bench (H. 0.82 Br. 1.64) begins at 1.05 m. from the entrance and runs on as far as the cult niche. The r. bench (H. 0.84 Br. 1.60) however, stops at a distance of about 1 m. from the niche and forms here a narrow passage, which is partitioned off by a wall which has been built against the bench itself (H. 1.60). There is a similar wall on the other side of the bench near the entrance. By this partition a separate room, a kind of niche had been made. Along the front of the two benches there runs a wide rim (Br. 0.30), which is relieved by a five semi-circular recesses (diam. 0.35), there on the r. side and two on the left. On a distance of 3 m. from the cult-niche, there is in both benches on floor-level a deep hole (H. 0.35-0.40 Br. 0.27 D. 0.60). The cult niche is connected to the left bench and can be ascended on this side via one step. The niche (H. 0.97 D. 0.75) is arched and was formerly decorated with mosaic. In front of this niche on the floor of the central aisle there were three vases in a row. The first one was hollow and could be covered by a terracotta lid, the second one was square as well but smaller (H. 0.52 Br. 0.40 D. 0.44) and the third one was of a still smaller size and round (H. 0.20 diam. 0.30). In the arched roof of the sanctuary there are eleven holes, which are partly oblong, partly round and are encircled by a small strip of mosaic. The four oblong holes may have served as ventilators of for illumination; the remaining seven round holes may be explained in connection with the seven planets. In the already mentioned room next to the entrance there are a well and two oblong tombs. Opposite the entrance to the Mithareum there is an irregularly built apartment, which is formed by three arches, supported by pillars with Corinthian capitals. Along the walls of this apartment there are small benches. Via two passages one enters an adjoining apartment, the floor of which is covered with a mosaic and the arched roof of which is decorated with stucco and rosettes (L. 5.80 Br. 4.75). Along three walls of it there are small benches (H. 0.33 Br. 0.35) and in the side-walls seven niches of various sizes have been hewn out. Between these niches on the walls one can still see the traces of a mural, which probably dates from the time that this room served as a apodyterium of the private bath of the house. In two of the niches figures have been engraved, which may be explained as a Nereid on a sea-monster, and as the figure of a Naiade. Nolan wanted to bring this room with its seven niches, which should point to a worship of the planets, in connection with the Mithrascult, but this is not quite certain.